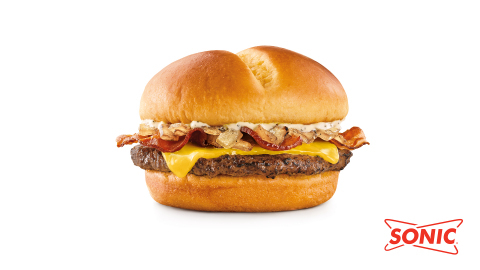 SONIC’s New Steakhouse Bacon Cheeseburger Brings Steakhouse Sizzle to the Drive-in | Sonic Corp.
OKLAHOMA CITY--(BUSINESS WIRE)--Nov. 28, 2018-- SONIC® Drive-In (NASDAQ: SONC) adds a new Steakhouse Bacon Cheeseburger so you can enjoy the classic sizzling flavors of a steakhouse burger from the comfort of your own car. Complete with tasty ingredients you might expect from a traditional steakhouse, SONIC’s new Steakhouse Bacon Cheeseburger elevates the quintessential drive-in favorite to an entirely new experience. Guests can get their hands on the SONIC Steakhouse Bacon Cheeseburger with medium Tots for just $4.99 while supplies last*.